The Peace, Support and Energy of Sivananda Ashram! Renewal on all levels: Body Mind and Spirit. If you have never been to an ashram, you haven’t tasted the nectar of the most supportive environment for healing transformation. If you have been to one, you know what I mean. Simply staying at the ashram, being exposed to the energy of the Swamis, the regular meditations, singing, and programs creates positive, perhaps irreversible change deep in your self. Our program adds to that already profound healing influence. 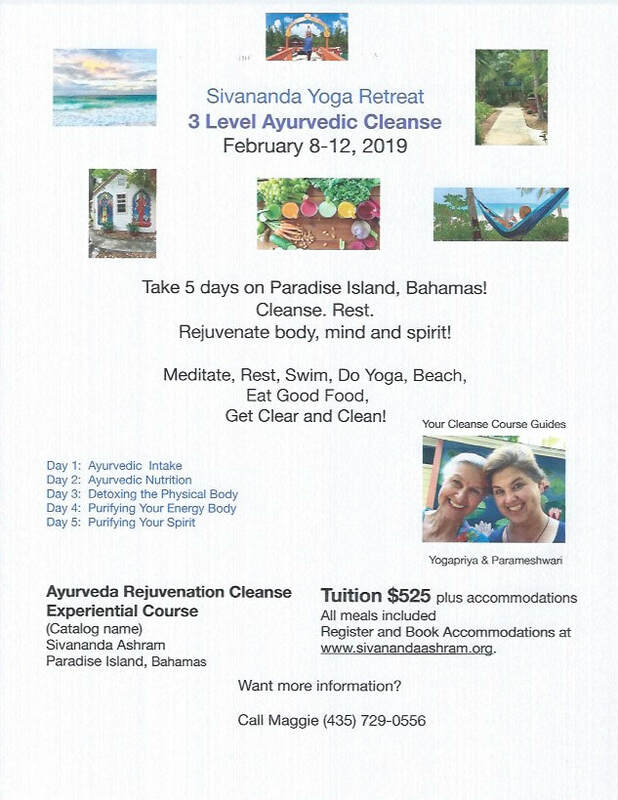 The 5 day Ayurvedic Cleansing program focuses on offering the unhealthy, imbalances in our selves into the fire of transformation and then filling the space with the love and light in food, thought and understanding. Parameshwari and I would love for you to join us! You will see my picture and the Program description. Scroll down to find the registration button. Or call Sivananda at: 1-866-559-5167 and talk to someone alive if you have questions about what accomodation type to choose. ​Lodging is extra but very reasonable at the Ashram.